Why is it so often we ignore ‘that feeling’, only to regret later that we did? For so many reasons we are given subtle messages from deep within, but we just don’t listen. Our Intuitive is very powerful tool. It is our best and most faithful friend. The one ingredient that we can trust without any doubt. And yet we disregard and disrespect ourselves time and time again when we just don’t heed the warnings it offers us. Why don’t we want to trust the very piece of us that speaks our truth and never lies? It doesn’t make any sense!! Our conditioning runs deep through our veins. The wrongs and rights that are ingrained in our psyche have us running around like robots. Pre-programmed daily routines, ways of thinking and a belief system that doesn’t allow us to follow our intuitive at the best of times. This is the stuff that we need to by pass to get to the truth of who we are and what we are really made of. Everything we have been taught to believe about ourselves by our Tribe is not our Authentic Self. Who we really are is the truth of our beautiful and radiant Spirit. ‘That feeling’ is the gentle murmur from our life force energy. The voice that we so often ignore is the very influence that always has our best interest in mind. 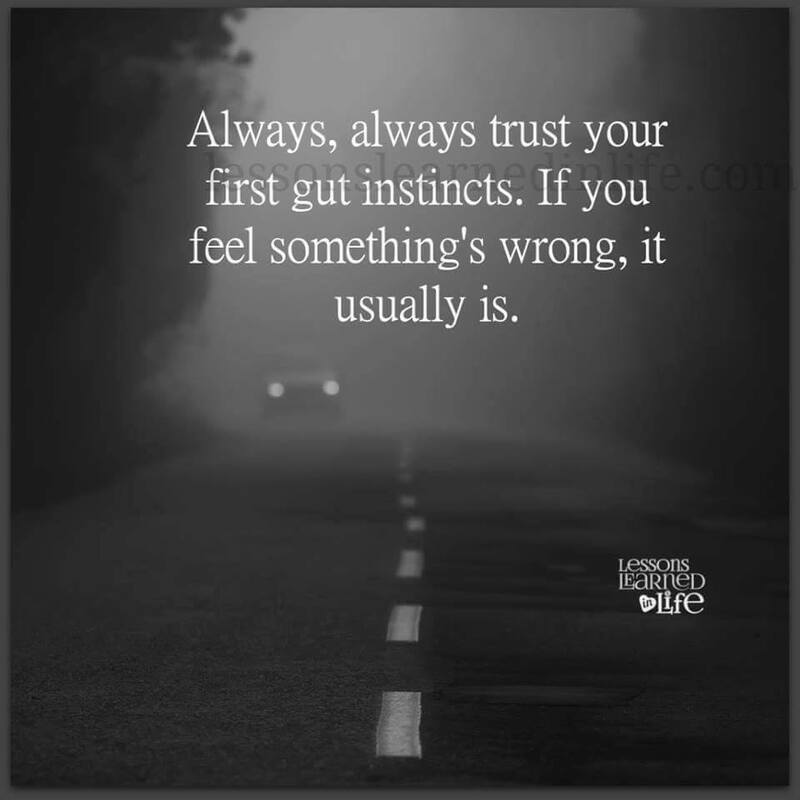 If there is a situation or circumstance in your life that doesn’t feel right and your gut feeling is telling you the same thing – believe without a doubt that there is something definitely undesirable happening in your life. Listen and don’t ignore the message this time. In order to act on your Souls messages you must work on courage and trust. Both of which we have been programmed to believe, not in ourselves, but in what our Tribe has taught us. You must change your way of thinking. You must begin to believe in ‘you’. This is not an easy process and it will cause you some confusion. But it will change your life in a way that will disempower your Ego, your Tribal thinking and it will empower the truth of who you are. All of the goodness that you so desire in your life will begin to show itself to you, just trust the process, change the way you think about yourself.